"Truth" and "unity" are words that send shivers up my back - the rallying cries of ayatollahs of every creed. "Unitiy" can only be achieved with violence, and "truth" is a man-made construct that has little to do with reality. "Facts" are only what we make them. In our current political climate, the term "post-truth" has been bandied about, but in reality "truth" has never been anything other than the statements that best fit the belief system and emotional status of the receiver. My belief system presupposes me to accept that global warming is a very large danger to our current society - but it also precludes me from accepting calls for "unity" and "truth". There are no magic solutions to the dire future that many rightly fear, but semi-religious delusional ramblings on "unity" and "truth" are never going to solve anything. Ayatollahs who distort the truth into deceit towards impure causes, and present a distorted version of the true unity I speak of, which will not be an option until the fundamental truth is understood by all. This is not the same. I speak of a fundamental unity born out of love. Unity is achieved from within our minds. There do exist irrefutable truths which are beyond the constructs of man, such as the irrefutable truth I have presented throughout this thread. Which has yet to be refuted, obviously, despite its abstract nature. It matters not - unity is on the horizon and you will soon understand all of this, despite its "improbability". It is not magical. The unity I speak of is unlike any we have known, a force many magnitudes greater than the divided humanity we are familiar with. In fact, our arrival there is inevitable. It defies our present logic, for it has never been, and so it cannot yet be fully understood. A glimmer in the distance, it has been, that humanity has forever been drawn towards. The light grows brighter until we are fully illuminated. I have presented nothing but IRREFUTABLE truths about our situation and about our fundamental choice here. What you do with it is, well, your choice. I compiled this last year regarding Franz Josef Land. An open thread about the Arctic seems a good place to post a link for it. Unfortunately, those are the words of all the above-mentioned ayatollahs of every creed. Look, 5to10, the problem is that what you have is a beautiful dream, which has been dreamed many times before, and which has never turned out to be anything other than a dream. Is it possible, in the distant future, for everyone to think in the same way? Possibly, but we're talking about a distant future; first we have to homogenise the cultures, languages and religions of the world, and I for one would be very sad to see that happen. It would also be far too late. Even given that, is it possible for all humans to act selflessly, and not for personal, familial or national gain, when the pressure on resources increases? No matter what your dream, I don't believe this is even close to being viable. What it comes down to is that you are asking a lot of very talented, energetic and intelligent people to drop what they're doing and adopt your strategy of persuading journalists of the Truth. There are some major problems with this. 1. Few people here believe that humans have the technological ability, at present, to stop catastrophic climate change. A dream of some technology in the future doesn't help. 2. No-one here (I think) is persuaded that all journalists are persuadable; and unless they speak with one voice then it's pointless. Given that the media thrives on controversy, it's probably not possible to have an open media that speaks with one voice. That point is surely decades away, if it's even possible. 3. Energy spent on your project takes energy away from other things, such as monitoring Arctic ice, trying to understand it, planning for the skills needed after potential societal collapse, etc. People who are extremely good at those aspects are not necessarily good at persuading reluctant journalists that what they are reporting on is more important than their livelihoods. What you are suggesting is a waste of skills that are likely to be essential for the well-being of society when the collapse starts to kick in. 4. By arguing for your dream of putting all our energy into planning for what is probably an impossible pre-emptive solution, you are taking energy away from a detailed understanding of what is happening, how it will progress, and how we can best survive in a post-overpopulation world. Telling people that they are selfish and lazy because they do not see the situation in the same way that you do, even when some of them have done an enormous amount towards reducing their carbon footprints and/or making their communities self-supporting, is arrogant and insulting. Personally, I think you are well-intentioned but misguided, and your 'solution' will set back our ability to cope with the crisis. I hope I've covered everything, because I don't have time to get sucked into this debate - I'm too busy helping the local community to become more sustainable, while attempting to earn enough to get by. Thank you for a great response. I recognize the similarities, but stand by the statement that I only provided irrefutable truth and the only path to our salvation. Awareness of truth, of the fundamental moral choice in the most difficult crisis, leading to unity by way of our collective good will, which is hidden beneath our ignorance and confusion. The understanding will destroy those barriers and awaken that goodwill. Correct. It is a beautiful dream which has never happened.. because there has never been a time wherein we've needed to dream it so desperately. Should events unfold that make abrupt climate change and imminent, large-scale collapse or total destruction patently obvious, unavoidable to the vast majority (not even close yet), said dream will suddenly become a possibility. It will become a necessity, indeed, to succeed in any efforts. This will be widely understood, and very quickly - it is obvious even now. So I do believe that this dire situation, should it unfold (And it sure looks that way more and more) will be unlike any other humanity has experienced in a big way, thus our thoughts and choices will change rapidly to focus on and suit the situation. People have children. People love the natural world. People appreciate consciousness. People don't want to die. There are MANY strong motivators to work together. Combine that with the internet, we are all instantly connected. Things are instantly translated. This world is ripe for that dream to become a reality, in the not too distant future even. Through this coming awareness of our position and recognition of our fundamental choice, we will seek and find togetherness. And out of togetherness, we will seek and find awareness and truth. Again, and this is a hard one to speak about because I have no way to prove it with evidence. All I can say is "It just makes sense"... A unity this strong would no doubt be much more powerful to influence positive change as we progressed in the future beyond crises. Think of it this way... We are always progressing a little bit more towards awareness and understanding individually and collectively.. and right now we are still slowed down greatly by rampant division. Imagine the speed of our progress if it did not exist. I am proposing that though we cannot see the solutions in the context of our divided world now, that once unified behind making the positive choice, after we recognize the fundamental truth of our position, division disappears. To weather the storm together, is to do it out of unified goodwill, labour, and optimism. How could we be expected to fall back into this fog after doing that? With the awareness we will gain... It is literally like the singularity, as someone else said. I can't even conceive the potential of a truly united, totally connected humanity that respects the natural world deeply. Problems would just start to disappear, we would be working as a well oiled machine instead of a rust bucket. This must be a very optimistic future. Again. viewing the situation in the context of an extremely divided humanity. Our overall potential greatly increases in unity backed by truth and open honest communication, in every way. There would be no more deception clogging up the flow of information, this is again nigh inconceivable. This is all possible with the internet and modern media. It will be sparked by sudden global awareness that yes, in fact, the end IS nigh. Be that 2 years from now or decades away, as you say. This will unify the focus of the media naturally, once the truth of the situation can no longer be avoided in the minds of the vast majority. Many events could lead to this awareness and the weather is predicted to be more violent and unpredictable. Unless it all comes crashing down and kills us all at once, people will be asking questions. Journalists included. This is already happening. Aside from "preparing for societal collapse" (I truly believe we are headed for an amazing future beyond this present despair, that energy is spent towards the wrong cause. There is a solution in unity, we should spend energy on that) I accept much of this as true in relation to the communication issues that may arise there. I believe some people gleaned valuable insight from my posts, or optimism, hope, positivity, and for that reason it's been worthwhile. Moreso, scientists are so rational that who better an audience to refute a hypothesis? I believe in what I say, I must subject it to scrutiny as well as use my time wisely in doing so. I believe you all can and will eventually do something with this understanding or I wouldn't be here in the first place. Reducing our carbon footprints and recycling is not enough. We will have to sacrifice so much more first in the name of what is right. We will have to give up almost the whole world we are used to for goodness or be a part of the destruction. Our supermarkets. Our oil addiction. Our differences. Our jobs. This is the difficulty of the fundamental choice we will all soon be faced with. We must sacrifice our wants for the needs of everything and everyone else, and ourselves. Perhaps it is not to evoke a sense of duty in you scientists to do more, but to hope to set your mind at ease for the future and prepare you to jump at the opportunity for your efforts to culminate into beautiful fruition. I only meant to show the power of the fundamental truth and the fundamental choice all will be faced with soon. If you take nothing else from my messages, let it be that. I truly thank you for your response. It is rational, it is focused, it is without malicious intent. Thank you for that. I will leave you all alone now unless I'm asked to respond again or deceptive attacks on the truth persist. Have faith for the future, it is a bright one. Most of us are good, deep down, just very confused, and thus irrational. I believe that. Don't you feel like I do, that this thread is a waste of time/energy? - If not, do you intend to have some? Just bare answers, w/o comments, please. Those answers seem important to understand where you speak from. You are never wasting your time and energy in pursuit of the truth. I am not the messages I relate, and they are not mine to claim ownership. I am merely a vehicle for the truth to be shared. Discussing my personal life is purposeless. Focus on the message. You will find unfaltering peace of mind in the truth therein. A troll seeks discord through deceit. I seek unity through understanding. You do not believe in unity. Who is the troll? FWIW, I have him (her?) on ignore. There's a place somewhere on the ASIF, I suppose, for bashing and berating those who refute, or just simply disagree with, your profound thoughts on how we'll all, I don't know, gather together at the base of The Tree of Souls and use a tsaheylu to tap our neuroconductive antennae into the spirit of Eywa to help save us from our self-made climate catastrophe. But this thread probably isn't that place. I suppose the term "open thread" can mean different things to different people. But to me it simply means this particular forum is for discussing things associated with Arctic sea ice that aren't easily categorized. This isn't where we should discuss fried chicken recipes, or association football, or stock prices--or, you know, comparative religions. So: as many others have suggested, can we *please* move this conversation elsewhere? what's more annoying than a drunken believer of free-market economy? * a drunken believer of communism. 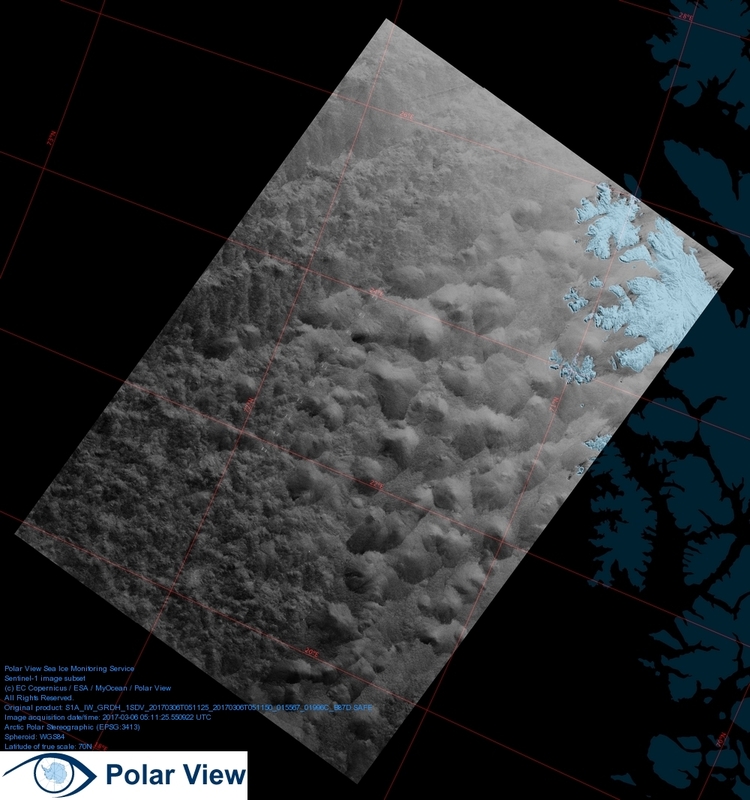 I've been tracking for 3 week via Polar View some large blocks turning the NE corner of Greenland into the Fram, but they are kind just sitting there. Hoping to make an animation at some point. Images are from 2/13 and 3/4. Wow! Thank you for sharing, Tigertown. That's an inspiring and beautiful collection of images. You're right - figuring out a way to usefully convey and ultimately have your wealth of information widely recognized and understood such that it is used is totally not related to what you're working on here. You just want to reveal truth amongst yourselves, while complaining together that not enough people get it, I understand now. You should just carry on doing what you've all been doing for the past umpteen years then - knowing all the details, while pining for ears that can hear you or a mouth that can properly translate towards understanding. Keep plodding along this same old course, and find the same old results, or revolutionize the process to find new ones. The fundamental prediction is obvious: We are in deep trouble and need to work on this ASAP. The issue now is CONVEYING it so that everybody gets it we can choose to work on it or not, not seeking to add more percentiles to the overall probability of it happening, by way of looking for more supporting data or otherwise wasting time. The Fram has really been surprising lately. It looked liked it was going to take off like a rocket, but then it just kind of slowed down. I guess it's probably a good thing it did so as to allow the volume to get a little higher. The shape the ice is in and all, I am thinking the Fram will flow freely once insolation gets to the CAB. Re. images of Fram. Even if there is not as much move as one could expect, OTOH there seems to be very few fast ice. I wonder if the presence/absence of fast ice along the coast is an important parameter in slowing down the export. Any hints about that point? Thanks for that TT. I really enjoyed it and it is nice to see what a stunning and beautiful landscape and scenery they have up there. Much appreciated! I think of it as a turbulent flow. Depends on size/structure of blocks and pressure toward the coast. Of course fast ice is reducing the size of the flow, like a buildup in a constricted artery. Those big chunks were broken free, iirc, in February when the last big Atlantic storm swept thru. I expected them to sweep right on out, but conditions caused them to stall and drive back toward the coast. here's a few intermediate images from 2/18, 2/24, and 2/28. As you all can see, I have moved the thread. I never liked it to begin with, because there's no need for open threads on a forum, but I try to take a laissez-faire attitude and accept it if others really want it (and stop spamming the freezing/melting threads). I didn't the long screeds in this thread, so sorry for not intervening earlier. I have asked 5to10 to tone it down, even though I believe he would be happier and more productive in another venue. Are those big blocks MYI? Looks like busted up formerly Fast Ice. I agree it was fast...stuck to the coast. What can you say about age/thickness, if anything? ......I have asked 5to10 to tone it down, even though I believe he would be happier and more productive in another venue. As icefree Summers approach expect an increase of such outbursts. Continuing to post pictures and data in such an environment would be like constantly checking your altitude after both shutes have failed. How about "Ice free Winters!" If you go back over the days on worldveiw it appears that very little water passed north of Svalbard allowing the ice to reform to some extent, to the south it was a different story, there were bursts of activity when streamers emerges from the ocean, the ocean grew filthy, and ice was accelerated from the south side, sometimes reaching the current flowing by N.Z. mostly this shows up as turbulence but once a certain threshold of flow is reached rotating [and scouring] currents form, which I'm guessing shed some of their energy into evaporation. The first link is self explanatory, the second is an image of the turbulence off of the coast of Norway where the Atlantic waters have to climb the shelf or head north, [i'm guessing the locals have some special words for this type of seascape], neither of which are they energetically comfortable with. What I think is happening in the 2 images is the deep arctic waters are forcing their way into the deeper reaches of the glacier fjords, displacing the fresher water already there, this is forced out through the returning atlantic waters and ice causing the 'paisley' vortices and melt. One note of caution. Even if the melt season turns out that there is not a great melt off and therefore a conclusion could be reached that the melt season was too cold or not right for melting, the ice is still in very bad shape. On top of that the winter months are getting so much warmer and stormier that what ice hangs around and actually grows is not in very good condition. In conclusion, the Arctic ice that is there is on life support and unless we humans get our act together, the rest of the earths systems are going to change so much that the normal will not be as it was even 20 years ago. There is certainly a teleconnection between the Arctic and the rest of the Earth. Where I live, the trees have always been a rich green for my whole life til now, a place where everything could thrive with little effort. Now the trees are dead or dying with pale Autumn-ish looking leaves. Heatwaves, wildfires, floods, and droughts are happening all over the place. Don't be fooled by the TV media because they won't report everything at one time, so as to give you the big picture. The heat energy has built to a point that the Earth can longer hold it back from being harmful, even with the help of the vast oceans. https://go.nasa.gov/2neWQc3 zoomed once so the 200K is showing. Although i've run it from the 10th [til present] it gets interesting on the 16th when the ice shears from the coast, except for the area of Z.+79N., where it seems the more or less permanent[?] outflow of fresher water has glued the ice to the local islands and sea mounts. We've had 'streamers emerging the whole time which, I think, indicates the Atlantic waters are being forced south by the accelerated outflow through Fram, and with the tides coming to their fullest range in the next few days there should be some action in these east coast glaciers. Not so sure about Zachariae though, last year i expected it to break out from any time around now onwards, and eventually in sept. it did, a little, for a few days. Can anyone elaborate on how El Nino affects weather patterns in the arctic? I live in Los Angeles and know about its effects on NA and SA, but less so on the arctic. We are still in the spring predictability barrier, so it is hard to know if another El Nino is coming... However models are showing it could be big. A return to El Nino is frightening for aquatic life but how will it affect the ice? I know El Nino releases its heat into the atmosphere so that will have some impact, but I'm more curious about the overall weather patterns. Any insights are appreciated! Long time lurker here and this is my first post. Your profile has been released, NotAllIceIsFrozen, so you can post freely now. As far as I know, statistically speaking, there is no direct correlation between ENSO and what happens in the Arctic. Thank you to all who have helped bring this thread back to sanity and usefulness. Have given up on it, entered again by mistake. More than 20,000 people stood united against terrorism Sunday at a "Lovefest" vigil in Stockholm, two days after a truck attack on a busy pedestrian street killed four people. "Stockholm is our city, a city we are proud of, where we like to be. Fear shall not reign. Terror cannot win," Stockholm mayor Karin Wanngard said. Looking at what the extreme tidal range around the full moon, expecting drops in Kara or possibly across the north Barents continental shelf or even a further assault on NE Greenland, so far all three are showing signs. https://go.nasa.gov/2nXY6zK clicking through 9/10 we might have an interesting few days ahead. Daily updates have resumed for the 2017 melt season. Bit puzzling, according to the data not a single melt day so far? In recent decades, the Greenland ice sheet has experienced increased surface melt. However, the underlying cause of this increased surface melting and how it relates to cryospheric changes across the Arctic remain unclear. Here it is shown that an important contributing factor is the decreasing Arctic sea ice. Reduced summer sea ice favors stronger and more frequent occurrences of blocking-high pressure events over Greenland. Blocking highs enhance the transport of warm, moist air over Greenland, which increases downwelling infrared radiation, contributes to increased extreme heat events, and accounts for the majority of the observed warming trends. These findings are supported by analyses of observations and reanalysis data, as well as by independent atmospheric model simulations using a state-of-the-art atmospheric model that is forced by varying only the sea ice conditions. Reduced sea ice conditions in the model favor more extensive Greenland surface melting. The authors find a positive feedback between the variability in the extent of summer Arctic sea ice and melt area of the summer Greenland ice sheet, which affects the Greenland ice sheet mass balance. This linkage may improve the projections of changes in the global sea level and thermohaline circulation. I was curious about this conversation in PIOMAS, and was hoping you all would continue it here. Looking at this image posted by AndrewB, and thinking about how chaos seems to be unfolding, it's possible that 2017 ends up outside [below] 95% confidence limits, not even unprecedented. Ofc, would be nice to get some expert opinions on this years projected melt rates and the data. This is so far off topic that I decided to post it here. Nothing to do with the Arctic, ice, weather, politics, or the climate. The above link is to a Nature article describing the discovery of a Mastodon in San Diego, along with stone tools used to work some of the bone, that dates back to 130 K years ago. While artifacts of this age may not shock our European readers, the Americas were assumed to have been settled less than 30,000 years ago, and less than half of that age by those who still believe that the Clovis were Americas first residents. To say this is huge understates the importance of this find. It's only in recent years that any finds below the Clovis horizon were taken seriously. This blows previous studies of the earliest peopling of the America's totally out of the water. Who were these people. Did any of their offspring survive. If not, why not? There is a site north of me that has been claimed to contain stone tools from before the ice age. It has not been accepted because of it's supposed age - this now needs to be looked at afresh. In California the "Early Man Site" has claimed tools of this age. I've been to both of these sites, at the Ontario site I was accompanied by the son of the chief researcher. At the Early Man site I've sat beside a fire pit that was over 80K old. North American Archaeology is my other hobby and I felt I had to share this news. Thanks for sharing this, Terry. That is indeed stunning! I'm so relieved that you're not berating me for being so far OT. It really is a stunning discovery and I'm glad you found it interesting. Your leprechaun seems to have global warming down pat. The new discovery was of course peer reviewed before Nature would touch the story. Just like the pre-Clovis discoveries and continental drift, it may take decades before it's accepted. Even with the Clovis point found stuck firmly in a mammoth's rib, it took that long before the die hards accepted that mammoth and man lived together. This still could be disproven, but with the early man site in California and the Sheguiandah site on Manitoulin island, the evidence keeps piling up. More speculation i'm afraid. Looking at the following animations [how to embed these as they are right now escapes me] I'm thinkg the first shows a compression wave passing through the ice driven by the high pressure system emerging from over the CAA, top right. As the pressure wave passes it produces some internal waves which are more or less parallel to the source, then a surge of water follows, at depth, flooding into Amundsen and MClure, forcing the surface ice out. The second shows the movement of the surface ice driven by the same forces. Terry if that kind of thing interests you treat yourself to a copy of forbidden archeology cremo-thompson, stuffed with inconvenient facts, and nonsense.